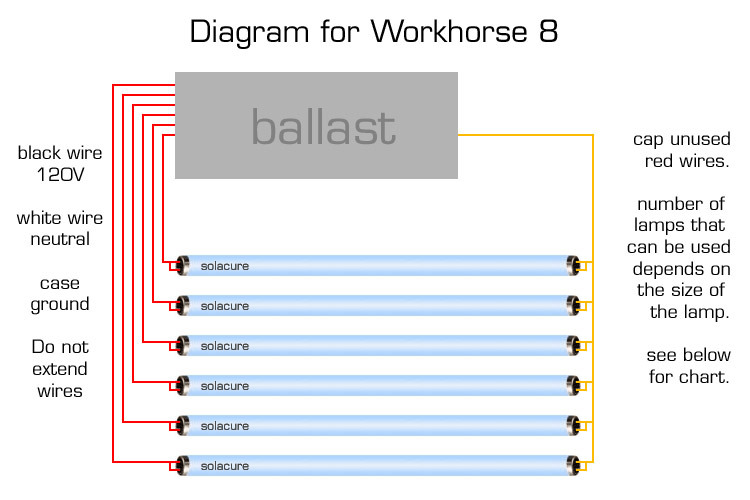 The Workhorse 8 certainly lives up to its name and is one of the most flexible ballasts made. This diagram shows the basic wiring diagram for 6 bulbs, but you may be wiring less lamps, depending on the chart below. Note: You must CAP any unused wires (don't connect them to a lamp end) and you must not extend any of the wires, except as needed to chain the yellow return wires. The ballast uses 18 gauge solid wire for lamp leads. F71 class lamps, including F72, F73, F74 and FR lamps of the same size. You have several choices here. The standard configuration is to power 3 in high output mode, and cap the unused red wires. You can also power 3 lamps in EHO by putting two of the red wires into each lamp holder. This is unsupported by Fulham, although we have tested this extensively. This pegs the ballast out at maximum power. Additionally, you can power two lamp in VHO mode using the same technique of using two red wires per lamp. This has been tested by Fulham and in our labs (we were the first to do this) but it isn't certified for this application. Technically, you could hook up 5 or 6 lamps and they would light, but the UV output is very, very low. If you power four F71 style lamps, the output changes to standard instead of HO (high output) and is fine, although not recommended as the output is still quite low. You can power up to 6 of these lamps using the diagram as shown. The fewer lamps you use, the most power each lamp gets, to a degree. Generally speaking, six F32T8 lamps will be powered at 32 watts (standard mode) while 4 F32T8 lamps will powered at around 40 watts. The sweet spot for our F32 lamps is 40 to 46 watts, although they will operate from 32 to 60 watts. If you are needing to cover a larger area, you get more effective UV if you use 6 lamps at slightly lower power, compared to 4 lamps at slightly higher power. Of course, more lamps and more power is always best. As long as you are using our lamp holders (or any lamp holder that is internally shunted) then you don't need to worry about jumping the pins. If you are using an existing fixture, you probably need to manually jump the pins. You can see if the two pins have continuity with a volt/ohm meter when nothing is wired to it, or look at how many holes (although this is a less reliable method). Most lamp ends are NOT shunted, but often the ones that are have two holes for wires instead of four holes. Not properly shunting the lamps ends, either by a physical wire or by using shunted lamp holders can reduce lamp life significantly. Assuming you are using our lamp holders, you just need to use a short piece of solid wire (can't be stranded, 18 to 22 gauge should work, 18 is best) to jump from holder to holder after you have installed the yellow wire from the ballast into the first lamp. Be sure and tug the wire a bit to make sure it is being held firmly in the lamp holder. When using FR71 lamps, the Workhorse 8 is very flexible. 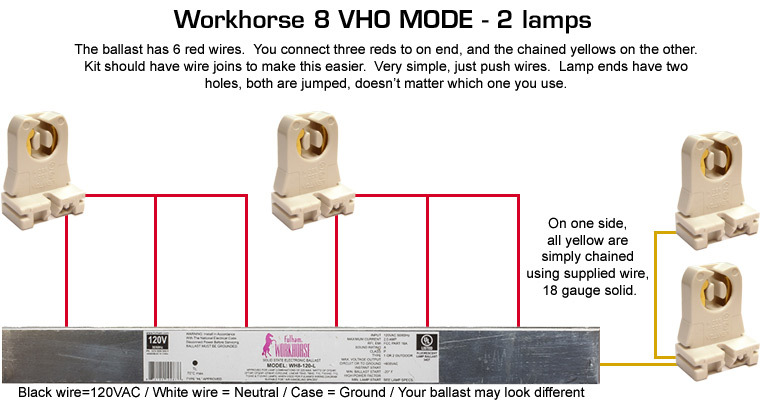 You can run 3 lamps in HO mode or 4 lamps in standard mode using the wiring diagram at the top of the page. You can also use EHO (120W) or VHO (160w) lamps using this diagram. It requires two red wires per lamp. You should not power standard or HO lamps with this configuration, as the anode/cathode sets (and the gas pressure) is not designed for it. All Solacure FR71 lamps, even those marked at 100w, are designed to run at 120W in EHO mode. To run in VHO mode, you should select 160w to 200w lamps, which are also available. You can achieve EHO mode using three lamps and VHO mode using two lamps. These are not certified by the ballast manufacturer, but they are configurations that we have tested extensively.